Nestle Purina brand dog food is pictured in Mexico City, January 24, 2014. (Reuters) - A California dog owner whose English bulldog died in January has filed a lawsuit against Nestle Purina PetCare Co [NESNP.UL], alleging his dog and thousands of others have been sickened by pet food that contains harmful toxins. The suit, filed in federal court in San Francisco, claims that all three of Frank Lucido's dogs became ill in January after eating from a bag of Purina Beneful dog food. One of the dogs died and a post-mortem veterinary examination revealed signs of internal bleeding in the dog’s stomach and lesions on his liver, the lawsuit claims. Lucido claims his two other dogs, a German shepherd and a Labrador, remain ill. The dogs were healthy until Lucido bought Beneful dog food for the first time, the suit claims. Other consumers have made more than 3,000 online complaints about their dogs becoming ill and/or dying after eating Beneful products, according to the lawsuit. The dogs showed "consistent symptoms, including stomach and related internal bleeding, liver malfunction or failure, vomiting, diarrhea, dehydration, weight loss, seizures, bloat, and kidney failure," the suit said. 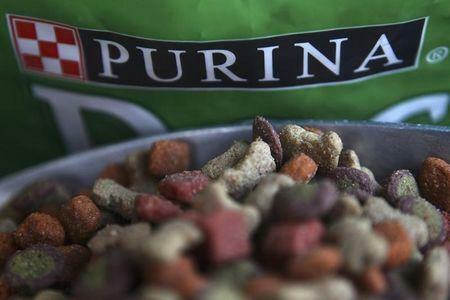 There was no immediate comment from St. Louis-based Purina PetCare but the company says on its website that it maintains "a strict code of standards for buying, storing and processing ingredients used in our pet foods." Keith Schopp, a Purina PetCare spokesman, was quoted by the St. Louis Business Journal as saying the lawsuit was without merit. "There are no product quality problems with Beneful," Schopp told the Business Journal. The suit seeks class-action status for anyone who has purchased Beneful dog food in the past four years and incurred costs due to illness or death of their dogs tied to consumption of Beneful. The suit claims Beneful contains substances that are toxic to animals. There are concerns about many of the branded dry kibble dog foods, including Purina Beneful Healthy Weight and Purina Beneful Original, according to the lawsuit. Among the allegations, the suit claims Purina was negligent in selling Beneful without adequate quality control and testing, without using proper manufacturing and production practices and without properly investigating reports of pet deaths and illnesses following consumption of Beneful.